Ahead of her appearance at this year’s Unsound Festival, Scott Wilson talks to Camella Lobo about the sometimes challenging path to the release of her debut album, Restless Idylls. “I’m sorry I had to push the interview an hour,” Camella Lobo explains as I contact her at her home in Los Angeles, “it was my husband’s birthday last night and we had a dinner and some drinks, so I slept in a little later than I expected.” Despite her mild hangover, Lobo is the kind of person that immediately puts you at ease with her warm manner. This domestic scene – occasionally interrupted by her cat – is something completely divorced from her work as Tropic of Cancer, a project whose combination of synthwave, techno and post-punk influences can often be bleak and introspective, and whose image presented through artwork on records for Downwards, Blackest Ever Black and Mannequin has been an occasionally macabre one that seems on the surface predisposed with the darker corners of the human psyche. ability to create musical narratives that appeal to some more primal part of human emotion, assisted by her oblique method of storytelling which is no doubt informed by her early interest in short story writing. The path to Restless Idylls has been a long one for Lobo. Growing up in Los Angeles, her Brazilian father introduced her to the music of his home country, while her American mother introduced her to artists like Jimi Hendrix and The Cure. Lobo herself was an avid radio listener with a fondness for what she describes as “low rider oldies” and “murder ballads”. At school she sang in a Catholic choir and at college, as her desire to make music had become a more significant urge, Lobo took formal singing lessons, hoping it would help her replicate the sound of the production around Sonic Youth and My Bloody Valentine. The reality however, almost caused her to give up entirely. “When I got to these classes, they were telling me to do something that was very counterintuitive to me, and so the first time I ever had to perform in front of a class – this was in I think a week of being in the course – I sang the way Kim Gordon would sing. I sang more in ethereal tones, and that’s just not something that is prioritised in classic music instruction…I hated it, to put it bluntly.” It wasn’t until she met Mendez at a show several years later that things started to fall into place for Lobo creatively, with the pair going on to write two EPs and a single together. Despite the obvious connections to minimal synth and post-punk, Tropic of Cancer’s music is imbued with something much more impressionistic, rooted in the sun-drenched climate of her native Los Angeles. It makes sense to discover that Lobo’s biggest creative influence is Broadcast’s Trish Keenan, whose strong narratives and timeless interpretation of pop and psychedelia could be seen as an earlier British counterpart to the way Lobo combines classic song structures with primitive electronic tones. Despite the cover’s rejection of a certain aesthetic, it nevertheless taps into another in its iconography of early Hollywood’s emotional duality – a fascination that she tells me came in some part from her father, who was a homicide detective for the LAPD. “I’ve always been completely obsessed with that Noir age of Hollywood decadence,” Lobo explains, “when I was growing up, I used to read tons of books about crime and about Los Angeles in particular.” Although the interest in her environment and its rich history has certainly informed the album’s artwork and the visual aesthetic of Tropic of Cancer in general, Lobo is keen to stress that the influence on the music itself is much less literal. “I guess Hollywood particularly is an influence because Los Angeles is where I grew up – but it’s that idea of the rise and fall, that whole idea of ‘the brighter the light, the darker the shadow’, that the better your life looks on paper, the worse it is in reality.” Even if not taken literally, it’s hard not to see this idea in track titles like “Beneath The Light”, taken from last year’sPermissions of Love EP, whose cover (and that of A Sorrow Of Two Blooms) seemed to tap into film noir’s idea of a surface beauty obscured by shadow and uncertainty. 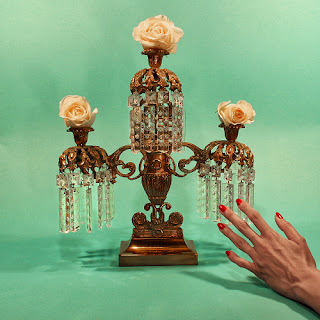 Of course, aside from those immediately involved in the Tropic of Cancer project, it feels particularly prescient that the album is being released at the height of what seems like a flurry of similar acts which have released music in the past year. Aside from DVA DAMAS, who recently released an album on the Downwards America imprint Mendez curates, acts like The KVB, Oake and HTRK have risen to prominence, while Blackest Ever Black and Powell’s Diagonal imprint have also championed the intersection between guitar music and primitive electronics. Although in a previous interview Lobo has denied being part of any LA-based scene, so does this preponderance of similarly parched sounds, make Lobo feel like she’s part of a growing global movement? “I think what’s happened since then is that something has gathered all of us together, and now it’s become a very cohesive scene – of people who genuinely love each other, and who are very supportive of each other’s music. It has to do with a number of reasons, but one is Mount Analog, the record store in Los Angeles. They’ve really created the nucleus in all of this I think, it’s like the glue that’s holding all of this together. And then you have Juan and Karl with Downwards America and Downwards in general, just allowing these artists to be part of this family. There’s Michael Stock from Part Time Punks, and everybody that comes through plays at Part Time Punks, the LA standard at this point for our scene, and Kiran (Sande) has just been such a big part of things – I just trust Kiran with my life basically at this point, I mean he’s been really super supportive”.